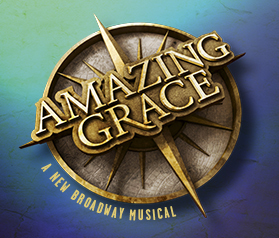 Broadway Ticket News: Amazing Grace Opens Tonight! A new and original show has come to Broadway. It's Amazing Grace and it tells the story of how John Newton, a wretch who was lost and then found, was inspired to write the tune that every single American knows to this day. It centers around John Newton, something of a prodigal son to say the least, who ditched his education in search for adventure, booze, and money (but mostly booze) via working the decks of slave ships. However, when his father cuts him off and John is impressed into the Navy, his life spirals downward. As his ship is taken over off the African coast, he is forced to run the slave trade from the opposite side of the world. Having enslaved thousands, John Newton realizes the error of his ways and seeks penance. On his return trip home to start a new life, he and his crew encounter a devastating hurricane. Pleading to God for forgiveness and making it through the storm, he becomes a changed man; who lives to free the people he once enslaved. And in the process, he writes one of the most beloved songs the world ever hears; Amazing Grace. The music in the show is powerful, the cast is quite talented, and the sets are picturesque. Together, they all work to guide and build up the production to the final namesake performance of 'Amazing Grace' sung in unison by the whole cast! The show is good, but with a story as original as this, the execution doesn't take any real liberties; which is not necessarily a bad thing. When you're surrounded by a spectacle like this show, you will be caught up and enthralled. I mean, really, there's no such thing as a night wasted on Broadway! If you want tickets to see Amazing Grace, you can give us a ring and we'll be happy to provide tickets for you! It plays at the Nederlander Theatre and officially opens today! Don't miss out!